This basic pan gravy teaches you how to make any kind of gravy using three ingredients: pan drippings, flour, and stock. A must for Thanksgiving, Christmas, Easter, and Sunday supper. Wondering how to make gravy from a brined cut of meat? The short answer is don’t even try. Seriously. The saltiness in the pan drippings will truly overpower everything else in your gravy. Sorta like a narcissist dominating the conversation at a cocktail party. Trust us. Don’t even bother. 1. After roasting the meat, transfer it to a warmed platter or plate and set aside to rest. 2. Skim the excess fat from the surface of the liquid that collected in the roasting pan, leaving about 2 tablespoons juices mingled with a little fat. Place the roasting pan over 1 or 2 burners on medium heat. Using a wooden spoon, scrape up the caramelized pan juices, then sprinkle the flour over the top, stirring constantly to blend it well with the fat and juices. Cook, still stirring constantly, for 2 minutes, or until the flour becomes a light golden color. 3. Still stirring, slowly add the warm stock to the roasting pan. Bring to a boil and cook—say it with us, still stirring constantly—until the sauce thickens and the mixture is reduced by about a third and has a gravylike consistency. Season the gravy with salt and pepper to taste. If desired, strain through a fine-mesh strainer. Serve immediately. Substitute 1/3 cup red wine, port, or white wine for 1/3 cup stock and add it gradually, as you did with the stock. I think this is a great basic pan gravy recipe to keep on hand when you make any roast item that needs a gravy. This would make a super easy Thanksgiving gravy as well as Easter roast gravy or anything else. I didn’t try any of the variations, but I think that each would work great! This is a great way to make gravy for a roast—even if you don’t have enough drippings. The roast I cooked didn’t surrender enough drippings for gravy, so I improvised by adding some butter. Sure enough, the roux yielded a fantastic sauce for our roast beef. I used the wine variation, adding 1/2 cup port for a well-rounded gravy, and everyone loved it. This recipe is foolproof, easy, and has demonstrated that it’s really versatile. My slightly alternative approach was to substitute the braising liquid from a big pile of short ribs for the roast pan drippings. I chose the herb and mustard variation. I added a heaping tablespoon of chopped fresh herbs rather than a small handful of dried herbs. It tasted perfect, and I didn’t have to strain the herbs out. This recipe is a nice way to end up with pan gravy after making any of a wide variety of roast meats, poultry, or game. It’s pretty straightforward, and open to many variations. I tried a beer gravy to use up the rest of the bottle of beer I had opened when making the Wheat Beer Chicken. I had some beautiful fresh thyme, so I added that to the gravy also. I cooked some vegetables and used the leftover chicken and gravy to make a crustless chicken potpie. There are even leftovers for tomorrow, all after having a nice amount of gravy to begin with. 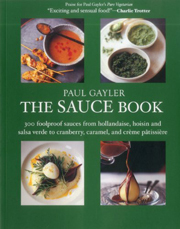 Basic Pan Gravy Recipe © 2012 Paul Gayler. Photo © 2012 Richard Jung. All rights reserved. All recipes and photos used with permission of the publisher.